Science Laboratory Department. 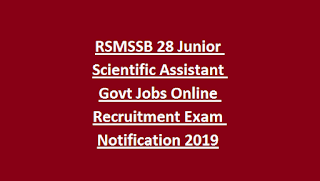 There are totally 28 Junior Scientific Assistant posts are available in RSMSSB Recruitment 2019. Candidates who have done B.Sc. Degree in Relevant Discipline are eligible to apply for the Junior Scientific Assistant Posts in RSMSSB Recruitment 2019. The online application forms will be available from 20-01-2019 onwards. The closing date to submit the filled online application form along with the necessary documentation is on or before 19-02-2019. Candidates will be recruited based on the written examination. 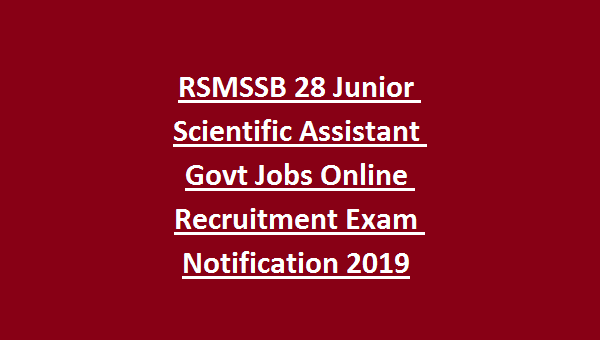 For more information about age limit, application fee, available vacancies and how to apply are given below for the RSMSSB Junior Scientific Assistant Govt Jobs Recruitment 2019. Starting date to apply online is 20-01-2019. Last date to apply online is 19-02-2019. As on 01-01-2020 the age limit for RSMSSB Junior Scientific Assistant Posts is in between 18 -40 years. The required qualification to apply for the RSMSSB Junior Scientific Assistant Posts Recruitment is candidates should have completed B.Sc. Degree in relevant discipline. The application fee for the RSMSSB Junior Scientific Assistant Posts Recruitment is for Gen/UR and Creamy Layer OBC candidates is Rs.450/-, for OBC Non-Creamy Layer candidates is Rs.350/- and for SC/ST/PH candidates is Rs.250/-. Candidates can pay the application fee through credit/debit card/ net banking. The written examination date will be on March/ April (Tentative). The online application forms will be available from 20-01-2019 onwards. The closing date to submit the filled online application form along with the necessary documentation is on or before 19-02-2019.